The Carnies have two very special Halloween shows this month starting with the Theatre Bizarre Preview Gala on Friday October 18th at the Masonic Temple in Detroit. The Procession Preview Gala includes strolling dinner, open bar and valet parking. Also half of the ticket price ($125) is a tax deductible donation. 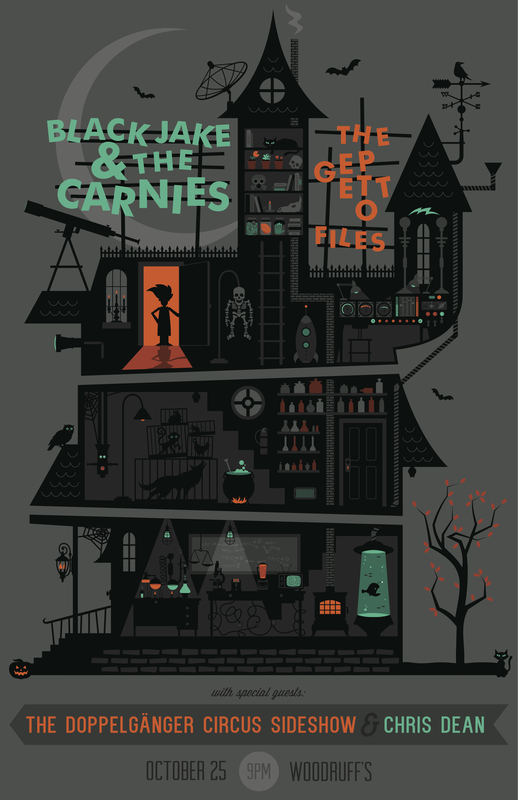 Then, Friday October 25th at Woodruff’s in Ypsilanti, Black Jake & the Carnies will be Puttin’ on the Ritz Carnie-style! Opening with our friend Chris Dean projecting a few delightful short films, followed by a bloody Miss Pumpkin Princess Pageant, and featuring the freshly reanimated corpse of the Gepetto Files! Black Jake & the Carnies will outdo themselves once again with their signature raucous set and carnival games to close out the evening. $6 with a costume, $8 without!